Take a look at how SoCo could help you in your career. Spaces and events that bring music alive! SoCo develops projects that engage and elevate. We are passionate about supporting music at all levels! To make it easier to explore what we do we’ve split our work into two areas: Engage and Elevate. 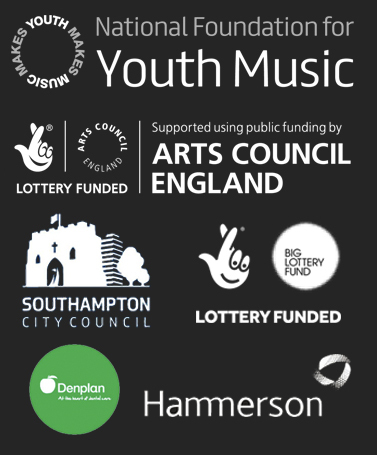 Engage covers our supported music making for children, young people and vulnerable adults. Elevate is about supporting music careers, though recording, promoting, training and development, pick one of these areas below to find out more. I've seen a massive increase in confidence in my child to give new things a go, and they can get up in front of others and show off! I first played drums at SoCo when they were in the Bargate, 5 years later I've just finished a European tour with my band. SoCo started it all! It makes them happy. It helps if they have frustrations because they can write songs or bang drums... Its real escapism which is so important. SoCo provided our clients with learning disabilities the opportunity to explore and learn in an inspiring space. Its been hugely beneficial. Working with SoCo puts me in my own zone, I can forget about everything else that's going on. It keeps me safe and out of trouble. We've noticed service users blossoming in confidence, enjoying themselves so much one or two have offered to volunteer with us!